The last post described how grandmothermath helped Asher and Kate each mix salt and food coloring in a glass of water. The glasses were set aside, in a place where they could be observed without disturbing the contents, to wait for each garden to 'grow'. 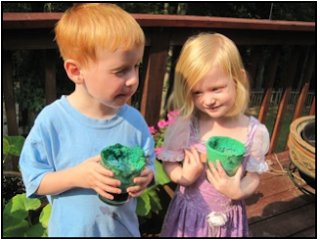 Their mom just sent these pictures of the kids proudly holding their glasses showing the colored salt crystals left in each glass after the water has evaporated. 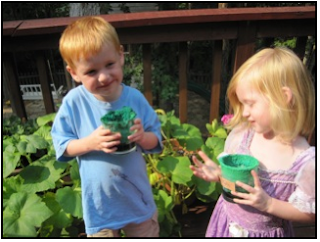 Kid's are naturally curious about the natural world and the time we take out of our busy schedules to help them learn to observe and ask questions about what they see, is a blessing for both the kids and the adults. Richard Feynman, the Nobel Prize-winning physicist, probably the greatest physicist since Albert Einstein, has written much about the influence his father had on his success as a physicist. His dad, not himself a scientist, would go on long walks with young Richard and point out interesting objects and events. If you would like to read about his father's (and others) influence on his approach to science, you won't do better than to read his book, The Pleasure of Finding Things Out: The Best Short Works of Richard P. Feynman. The book is an easy read so don't be put off by the Nobel Prize. Asher and Kate, grandadscience says "Well done!" Now, what happens if you pour water into each glass? Thanks Dad for posting this and for great ideas. The kids love your activities.